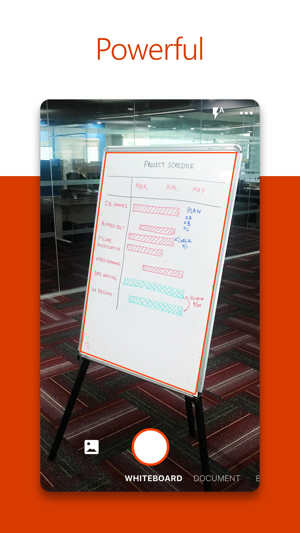 Office Lens trims, enhances and makes pictures of whiteboards and documents readable. 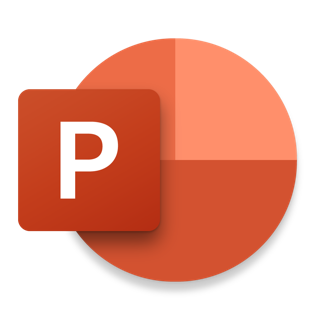 Office Lens can convert images to editable Word and PowerPoint files too. 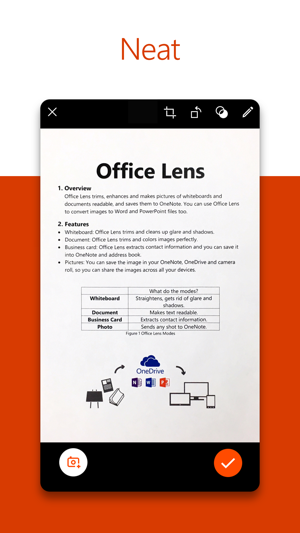 Office Lens is like having a scanner in your pocket. Like magic, it will digitize notes on whiteboards or blackboards. Always find important documents or business cards. Sketch your ideas and snap a picture for later. Don't lose receipts or stray sticky notes again! 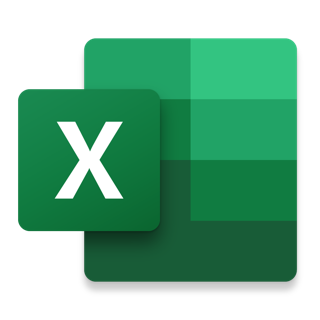 - Capture and crop a picture of a whiteboard or blackboard and share your meeting notes with co-workers. - Make digital copies of your printed documents, business cards or posters and trim them precisely. - Printed and handwritten text will be automatically recognized (using OCR), so you can search for words in images and then copy and edit them. 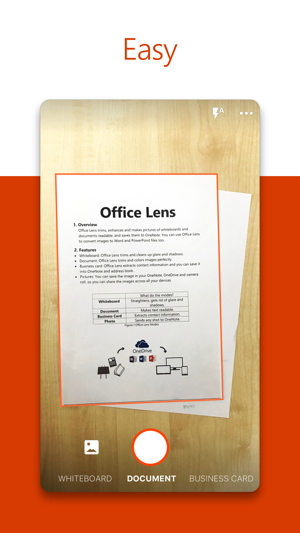 - With Whiteboard mode, Office Lens trims and cleans up glare and shadows. 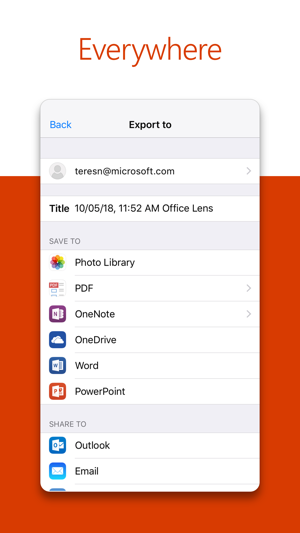 - With Document mode, Office Lens trims and colors images perfectly. - Pictures can be saved to OneNote, OneDrive or other cloud storage. - Business Card mode can extract contact information and save it into your address book and OneNote. This feature works best with the following business cards: English, German, Spanish and Simplified Chinese. Support for more languages is coming soon. 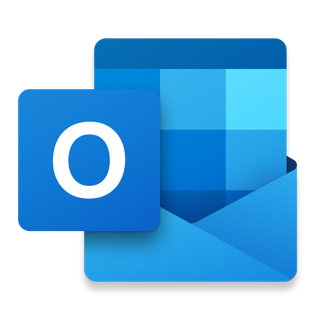 - Choose to convert images to Word (.docx), PowerPoint (.pptx) or PDF (.pdf) files that are automatically saved to OneDrive. Brainstorm meetings can often be mayhem, but the notes don’t have to be. 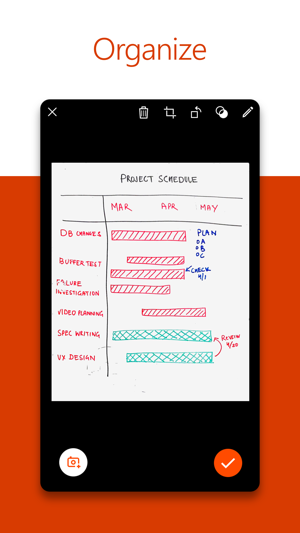 Along with capturing regular ol’ documents, this scanning app erases glare from shots of your meeting’s whiteboard. 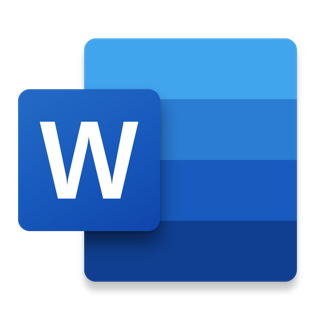 It also transforms your scans into editable Word and PowerPoint files. We see this mighty scanner tidying up other parts of our lives too—as an archival tool for jumbled receipts, handwritten recipes and our kids’ doodles. Accurate and easy to use. I use this app to scan handouts and documents as a PDF’s or jpg’s to drop quickly into notability. Even if the original quality is average most times I can get a usable image. I can snap an image quickly, (best with the flash if possible to eliminate shadows). The app squares it up. I save it to the photo roll and drop it where I want. The pics are sharp, clear and colour accurate (mostly) Ready for mark up notes, signatures or what ever I need. I’ve tried others. Nothing comes close. I don’t use the ocr or whiteboard function so I cant comment on that. No subscription needed, no ads. Full functionality comes if you use Word and PowerPoint. Best I’ve found for my needs. It’s become an important part of my daily workflow. (I use the app on an iPad Pro and iPad 2018 with the plastic stick) I only use iPads for the exclusive apps. I don’t like Apple’s iOS operating system, business model and their attitude to their customers. I have been using the Lens for a month or so and it has been great. It has a lot more features than I thought and once I did a bit of searching how to use specific bits it’s been great. I particularly like the multi page PDF saving to OneDrive. Fantastic for keeping receipt or manuals for things I’ve bought. All up very very impressive simple to use and now used daily.